Last week I reviewed The Undertaking which is a marvelous read in that it allows the reader to fully revel in feelings of rage, disgust and retribution (which is necessary relief if you’re watching political news these days). 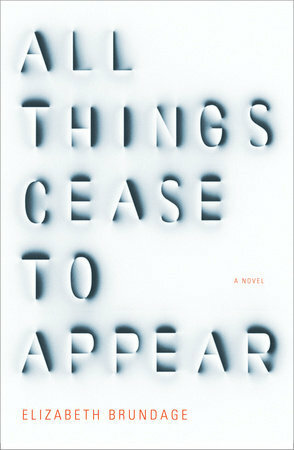 This is not the case in Elizabeth Brundage’s novel All Things Cease to Appear. It is much more attuned to contemporary times, when even though a crime is committed and the villain appears certain, there may be no justice. The best that can be hoped for is the passage of time and a collective loss of memory about the event. In this case, the setting is a small town in upstate New York and the crime is the vicious murder of a young mother, while her child sleeps in another room and her husband is off at work. All Things Cease to Appear is infused with a feeling of melancholy from the beginning. Even in sunshine the air is saturated with it, letting the reader know that despite the bucolic setting all is not well. This is likely because the house where Catherine Clare will be found dead is one already familiar with death. The Hale dairy farm had been in one family for generations, but thanks to the current one and the economy it’s going to be auctioned off. Unable to face this, the parents kill themselves leaving three teenage boys behind. Boys who will watch as everything they’ve ever known goes away. When George Clare buys the house for his wife and daughter he decides not to tell Catherine of the house’s recent history, providing a quick flash of insight into their marriage. But in truth they rarely spoke about anything beyond the superficial. He rarely confided in her, and in turn she neglected to ask any probing questions; perhaps, on some level, she knew he continually deceived her and somehow could not admit to it. All things point to George wanting to be rid of his boring wife and Brundage does not disabuse the reader of that notion, but there are oddities aplenty, making the novel feel like a literary version of the painting American Gothic. Even the house is suspect, with Catherine complaining that she feels watched and that there are cold drafts throughout. And if the present isn’t enough Brundage’s explorations of everyone’s past ramps up the dysfunction and widens the pool of suspects from the obvious to the quiet ones. There comes a point in any good novel where the author has to have done their work well enough that the reader can suspend their critical brain and simply relax into the ride. Brundage achieves this because there is not much subtlety to All Things Cease to Appear. Melancholy, foreboding, and gloom abound, but it’s all right because she assembles the novel with the same care and thought that goes into a 100,000 piece jigsaw puzzles. And in the same way, while you’re trying to put together the sky with 20 shades of blue and you think it doesn’t matter, only as you get further along do you realize how important it is. There are a lot of characters and stories in All Things Cease and Brundage gives each their time on the page—even the villain, because there is one, just as there is in life. What will be difficult for some is that also much like in life, there is no easy justice. Instead, each of the puzzle piece characters, in all their shades and tones, ultimately fit together and the whole picture becomes clear. I’ve been receiving samples this week for this one from my library’s online book club. I haven’t read the samples because of the scathing reviews out there, but your review puts it in my mind to go back and read them before they disappear at the end of the week. Its a hit or miss book! It’s a bit over-the-top. I wanted more resolution but still thought Brundage’s writing was lovely. I’m in the midst of this one right now, so I don’t want to read much of your review, but I’ll be curious to check back when I’m done and have written it up. Some of it I love, some feels like it could use some editing, but the overall emotion and environment I’m really enjoying. Wondering if you had trouble placing the story in the late-70s? It feels like it’s going on decades earlier to me, at least that’s the feeling the words are giving me. I’ve been on the fence about this one, Catherine; I’ve had trouble getting anything to “stick” lately, due to all of the changes I’ve had going on in my personal life with a new job, etc., and I’m not sure this one will do the trick. Thank you for sharing your thoughts!! I don’t think it will, Tara- it could feel very unsatisfying. This sounds beautifully morbid. 🙂 I surely want to read this. Thank you for this insightful review. I loved it. “Beautifully morbid” is the perfect way to describe it. There is no satisfactory resolution but that makes it real.